There may have been a bit of a commotion out on Burnside on Tuesday night, but the basement bar at the Doug Fir was filled with people ready to see one of the most buzzed-about bands of the year in their return to Portland. The crowd was not disappointed, as Viet Cong performed a frenetic and gripping set that showed that the talent matches the hype. Though this was the last time that “Viet Cong” played a show in Portland, this show guaranteed that people will line up to see these four guys perform in whatever the next iteration of the band will be. Like it was with Bully a few nights before, the audience was faced with the prospect of knowing ahead of time what the set list would be, for the most part. 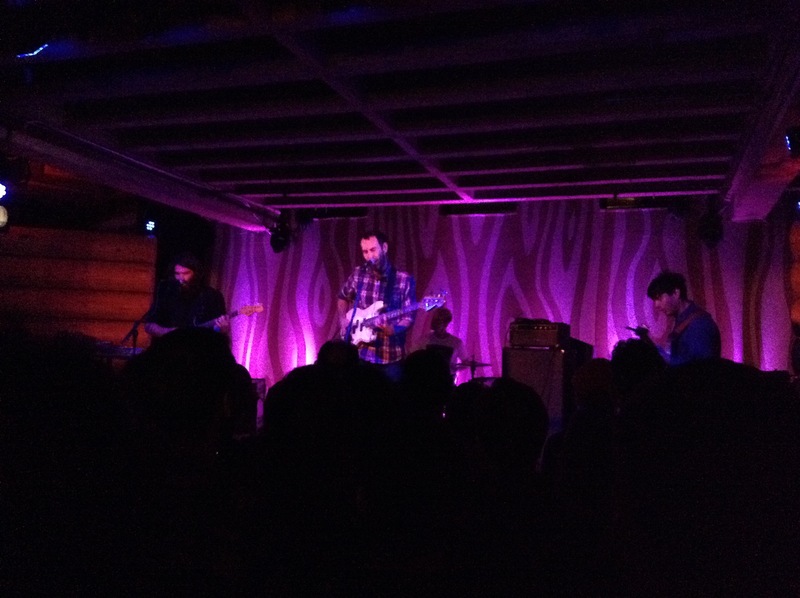 However, though the crowd was for the most part familiar with the band’s self-titled debut, Viet Cong started off the show with a couple of tracks off their self-released EP Cassette. The band then launched into the familiar frenzied strains of single “Sillhouette”, and the crowd responded with head bobs of recognition as well as loud approval for one of the album’s highlights. Instead of including some covers in their set, the band opted for the approach of stretching out some of their songs with extended intros and longer vamps, and the tension this created within the audience paid off in spades. I was surprised to learn that the distorted intro to “March of Progress” was not created through tape manipulation or other studio trickery, but with careful and precise alternating drumrolls. Mark Wallace’s work behind the kit had impressed me before, and this only added to his credentials. The band also was able to dazzle in their slower moments, like in the haunting “Continental Shelf”, which featured some intriguing synth flourishes. The clear-cut highlight was the epic closer “Death”, which had all four members showing off their technical prowess. Its Swans-like false ending was pushed past the breaking point, as a few members of the crowd had their fill with the extended section of single hits, but most stuck around for the payoff of the frenzied finale. It was an incredible finish, and left the audience clamoring for an encore, even if they knew it would never come. The band did not mention their name during the performance, opting instead to point out that Monty, Danny, Mike, and Matt were playing tonight, and the signs inside only said “HEADLINER” was performing at 10 pm. 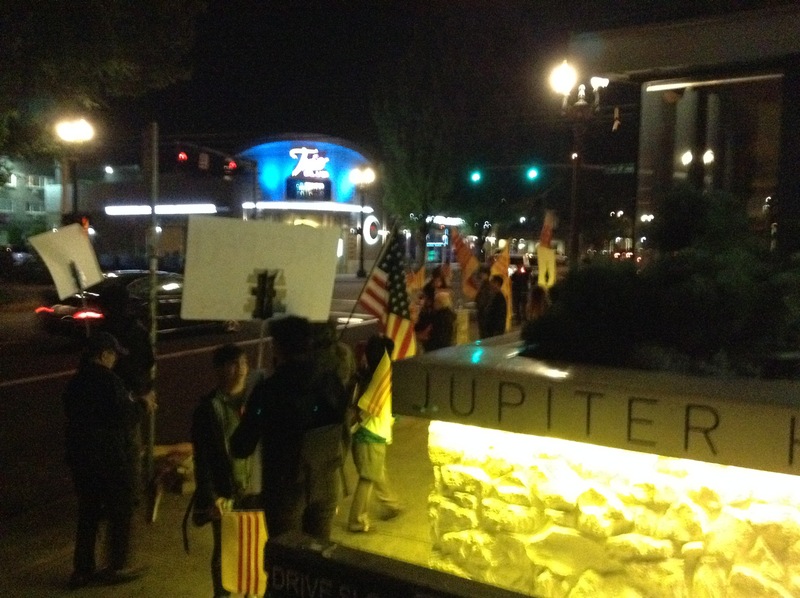 The protesters were armed with signs, pamphlets, and a megaphone, but they otherwise let people in without an issue. I do want to note that Gang of Four played the same venue a week before without incident, and that nobody seemed to care that the opening act was called “Grave Babies”. As for Grave Babies themselves, they put on quite the racket, but an enjoyable one if you ask me.